While away on a quilting retreat, I acquired some new fabrics. 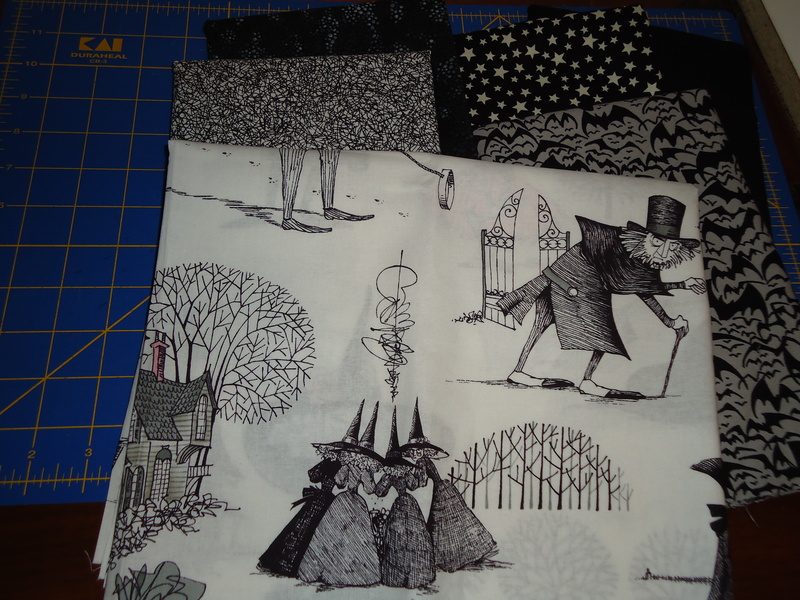 I don’t usually buy novelty fabrics, but as soon as I saw the new Ghastlies collection just inside the front door, I raced for the nearest cutting table. Definitely have to fussy cut the main print and frame it with some black and white. There are spots of pink in the Ghastlies prints, so I got some pinks to go with them. There’s something about the combination of black and pink that I love. 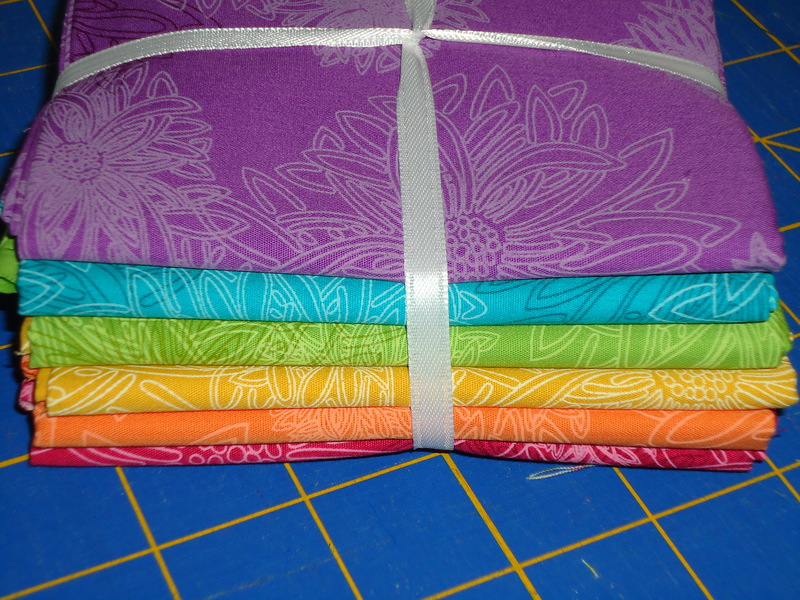 I also bought this cute little rainbow pack of fat quarters. Just seemed like something I had to have in my stash, kinda like solids. 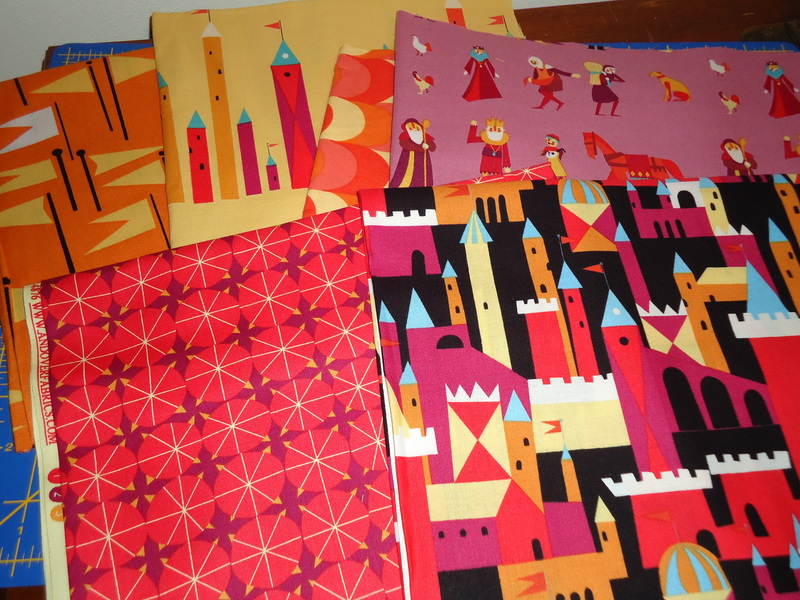 When I got back from the retreat, these Castle Peeps fabrics had been delivered in my mail. I usually tend to gravitate towards cool colors, so this time, I decided to change things up and get the warm fabrics. I don’t know what I’m going to do with most of these fabrics, but I just felt like I had to have a small sampling of them. Does that ever happen to you? Happens to me all the time. Looking forward to seeing what you do with the ghastlies. Love those fabrics. “Must Have” happens to me whenever pink roses are involved; I cannot bear to cut into them and the stack is growing! 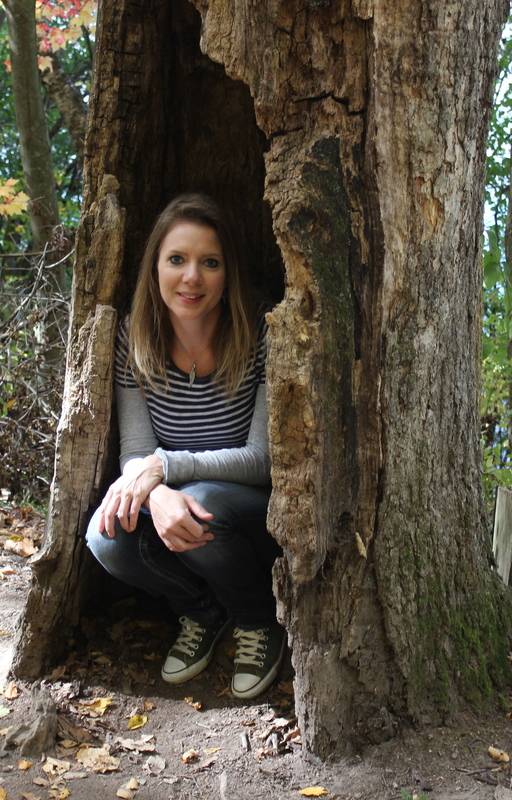 Boy, do I love the trees in that black and white (and pink) print – trees are another print I “Must Have”!! Do you know who makes those fat quarter prints? Those are awesome!! What you’ve shared today is really inspiring, so thank you, Terri!! The Castle Peeps fabric is one of my favorites this summer. When you don’t have a plan for fabric already, how much do you get of it? I always wonder that! 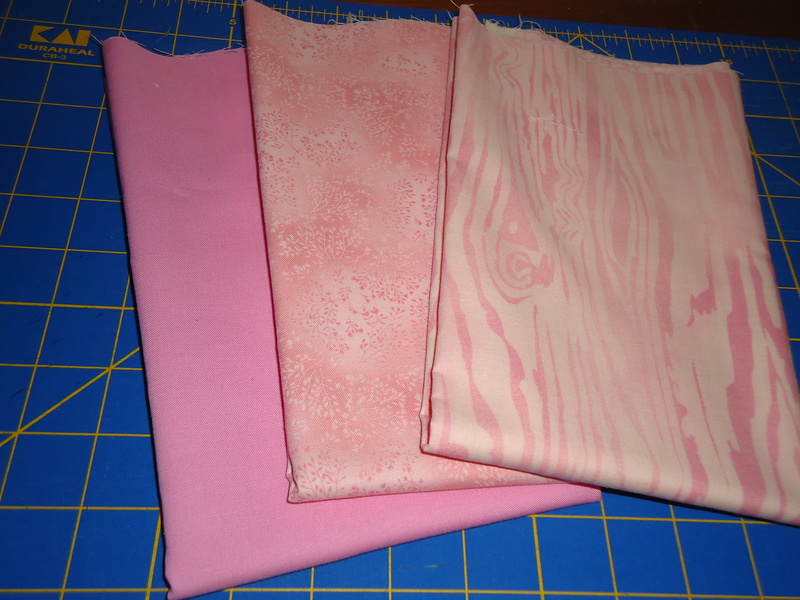 Anne – when I don’t have plans for a fabric, if I feel like I might use it for a quilt, I will just buy a fat quarter or a set of fat quarters. Since I make a lot of bags, I might get a half yard of a focus print so I have more choices later. Happens all the time! Can’t stop myself. Love those fabrics. I buy all the time and I have to stop but can’t. They keep comming out with such cool fabrics. Can’t wait to see what you do with them all. Oh Terri, we have the same condition!!! Very unusal fabric,will be interesting to see what you use it for. Have fun. No plan? You need a plan??? Yes, that happens all the time! Love the Ghastlies…just placed an order for a yard! Ghastly, my friend, simply ghastly! You’re so clever! Love the almost solid stack~summer popsicles in all my favorite flavors! Saw those Ghastlies on another blog, so cute. Those pinks will soften those scary ghastlies. Love the solids, looks like you’re collecting some pretty fabrics. What lovely fabric acquisitions Terri!! Looks like you will have lots of inspiring summer sewing ahead. You got some great fabrics there! I can’t wait to see what you do with them! No, that never happens to me, lol!!! I have to tell you…I’m not feeling the Ghastlies..or Ghoulies or whatever they are. I’m a total chicken-I hate Halloween. Yikes. Anyway. I DO LOVE LOVE LOVE Castle Peeps! They look like they fell right out of Shrek! HI Did you ever do anything with your ghastlies..if sew connect with me please..